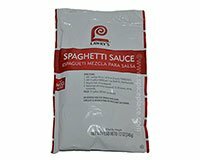 The easy convenient way to make Spaghetti Sauce or Pizza Sauce with Lawry's Spaghetti Sauce Mix. All of the Italian flavors are packed inside this pouch of Spaghetti Sauce Seasoning. No MSG Added. Lawry's Spaghetti Sauce Mix contains no added monosodium glutamate (MSG) beyond the small amounts naturally occurring in autolyzed yeast extract. Ingredients: Modified Corn Starch, Sugar, Salt, Garlic, Enriched Wheat Flour (Wheat Flour, Niacin (Vitamin B3), Iron, Thiamine Mononitrate (Vitamin B1), Riboflavin (Vitamin B2), Folic Acid (Vitamin B)), Onion, Spice, Yeast Extract, Citric Acid, and Corn Maltodextrin. Add 1 Lawry's Spaghetti Sauce Mix (12oz) to 1 #10 can (3 quarts) Tomato Paste. Add 1 1/2 gallons Water and 1 cup Salad Oil; blend thoroughly. Reduce heat and simmer (uncovered) 15-20 minutes, stirring occasionally. Add 1 Lawry's Spaghetti Sauce Mix (12oz) to 1 1/2 #10 cans (4 1/2 quarts) Tomato Puree. Add 2 1/2 quarts Water and 1 cup Salad Oil; blend thoroughly. Yields: 2 gallons (64 half cup servings). Combine 1/2 package of Lawry's Spaghetti Sauce mix, 3 cups Tomato Paste, 2 quarts water and 1/2 cup Salad Oil; blend well.